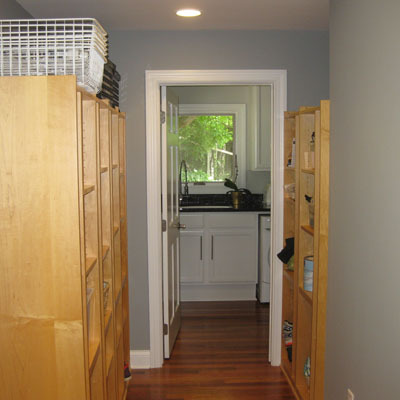 Although not as "glamorous" a space as the kitchen, the mudroom part of the addition is equally valuable to the every-day functioning of the house for this family. The wooden cubbies you see here were found on craigslist before this project even started, so we designed the mudroom space to be the right size to use them. It's not accidental that mom and dad's cubbies are on one side, and the kids' on the other — keeps things just a little bit tidier! The little window in the laundry room was located intentionally so it doesn't just serve the laundry room, but also brings light into the mudroom space and gives the family a view out to the backyard every time they come into their home from the garage.